As soon as ChatBots can interact like humans in natural language, the ChatBots (and later digital voice assistants) will come and there is no way back. Besides of traditional “question – answer” ChatBots there are almost unlimited applications for interaction with natural language and systems. All under the condition that the user experience has is excellent (at least better then present interactions with the mobile phone). Why a chatbot for ERP system? In case of Unit4 the idea popped up during the yearly User conference in 2015 to use Natural Language to interact with Unit4. 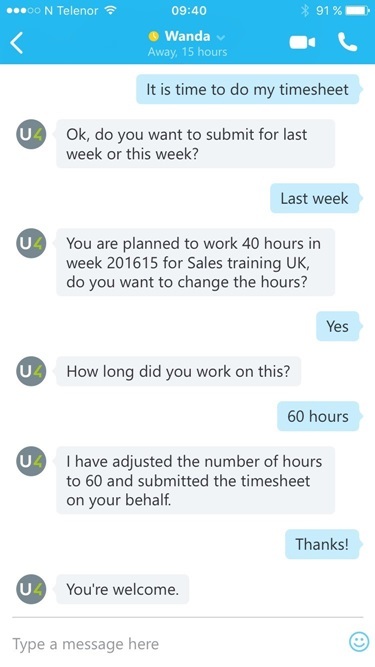 So it was far before Facebook and Microsoft democratized the Natural Language Processing in ChatBots. The trigger was the user, and not the launch of the Messenger platform by Zuckerberg in april 2016 like many ChatBots. Unit4 started with the time sheet as the timesheet is important for casual users. The casual user is not always logged in to the system and worse, probably often only mobile available. To reach users on mobile the “traditional” options are a a mobile website or an app. But if the user can interact in Natural Language in his favorite Chat app (like for example Messenger, Skype or WhatsApp) the user experience would be much better en more efficient then opening an app or the mobile website with an extended form. How is the ChatBot working? If you are interested or you have questions about chatbots in general or the use of Natural Language in ERP systems, then please contact me via the contact form. 2016-11-27 by Ywan van Loon filed under agile marketing, big data, deep learning, machine learning.